The three-story townhouse at 59 Charles Street in Greenwich Village is much the same as it was when it was built in the late 1860s. When the home was sold in 1967, the New York Times reported that the previous owner, Miss Emma Gerdes, lived in the house for eighty-two years.1 She moved there with her family in 1884 when she was eight years old and stayed long after her brothers moved away and her parents died. All the while, she kept the house almost exactly the same, slowly turning it into a time capsule. According to Times, there had been a few small changes—the large metal chandelier hanging from the hand-painted ceiling in the parlor was converted from gas to electricity, and the stairwell received new wallpaper in 1923. Recent owners have confined most of their home improvements to systems hidden inside the walls, such as plumbing, electrical systems, and air conditioning. Given its seemingly well-documented history, it was surprising to learn something about this building that had been long forgotten. A menu revealed that it once housed an Italian restaurant. 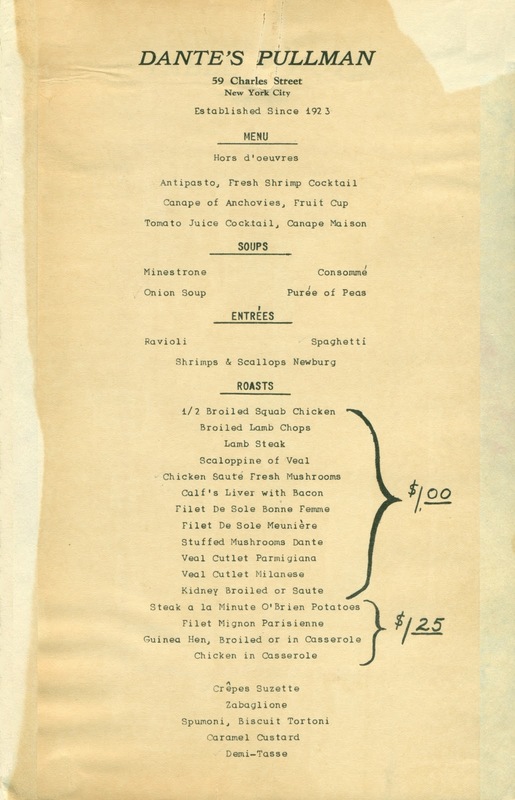 The enigmatic menu was discovered in a group of papers dating to the mid-1930s. 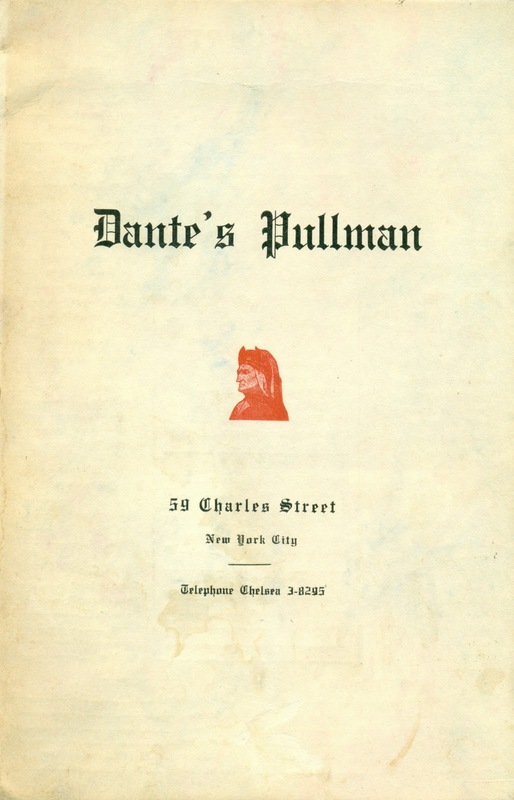 As shown on the over, a restaurant named “Dante’s Pullman” opened at that location in 1923, the same year the wallpaper was reportedly changed. Perhaps to help make ends meet, Miss Gerdes seems to have rented the ground floor of her home to an Italian chef named Dante, or at least to one who admired Dante Alighieri, the Italian poet of the Middles Ages whose likeness appears on the cover. The word “pullman” may refer to the small, narrow space in which the restaurant operated, reminiscent of a railroad lounge car. A small restaurant on the ground floor would not have disturbed the living quarters above. Below a typical iron-railed stoop, the house has a street-level entrance that leads directly into a room on the ground floor. The only other room on that floor is a big, square kitchen in the back. 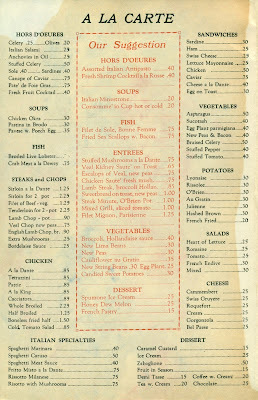 There were other eating places in the city that operated in residential spaces, such as the “parlor restaurants” in the tenement buildings of the Lower East Side.2 However, these miniscule eateries served home-cooked meals in the style of a particular city or small region in Europe, catering to homesick immigrants. The wide selection of dishes on Dante's bill of fare shows that it was designed to appeal to the tastes of the American middle-class. The townhouse at 59 Charles Street is situated between West Fourth and Bleecker, a quiet section of the street without any through traffic. Some famous people have lived on this block over the years. Novelist Sinclair Lewis called No. 69 home for three years beginning in 1910. Poet Hart Crane once resided at No. 79, and in 1943, folksinger Woody Guthrie lived across the street at No. 74 where he and blues-musician Lead Belly would stay up late singing with friends. Today, there is no hint that there once was a restaurant on the premises. Despite modernization, the kitchen retains some of the original details from the mid-nineteenth century like the system of bells that were used to summon servants; the old iron cook stove, with its handsomely-carved front, still stands in its walk-in niche. If Emma Gerdes had still been alive when the house was sold in 1967, the story of the restaurant might have been passed along. However, it is not unusual for a restaurant to be forgotten, despite having once been an integral part of urban life. 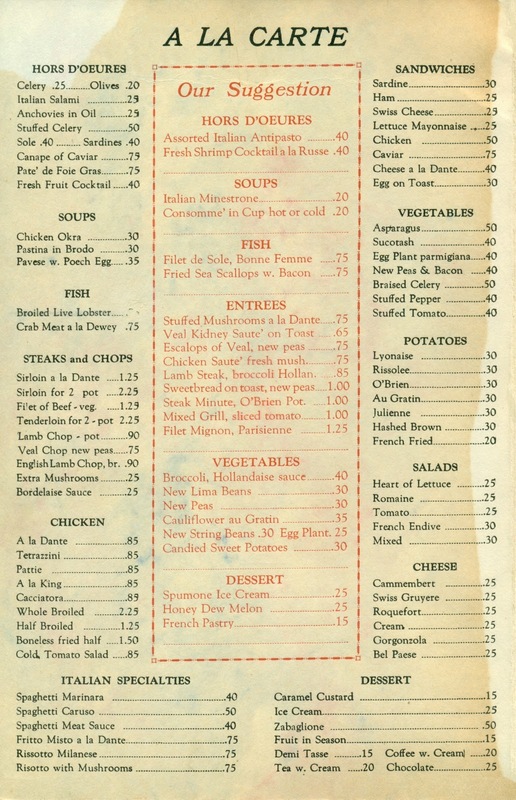 Sometimes all that survives is a menu, providing the only historic evidence that it existed. 1. New York Times, 23 April 1967. 2. Jane Ziegelman, 97 Orchard: An Edible History of Five Immigrant Families in One New York Tenement, New York, 2010. Henry, fascinating! Did you find the menu first, or vice versa? It started with the menu. After not finding any information on the restaurant, I focused on the address. Although there are two locations in NYC with that address, the telephone number indicated that it was in Greenwich Village, not in Brooklyn. Unfortunately, the 1967 article in the New York Times made no mention of the restaurant, but there was an interesting reference to 1923, the same year that the restaurant was established. The next step was to go there and take a look around—something I often do at this point in the process. I eventually learned that nobody knew that there had been a restaurant on the premises, and that there was no remaining physical evidence, despite the fact that Dante’s was in business for at least a dozen years. Thank you for this information, which adds so much detail to a brief mention of this restaurant in the 1931 diary of my great aunt Eleanor Britton. 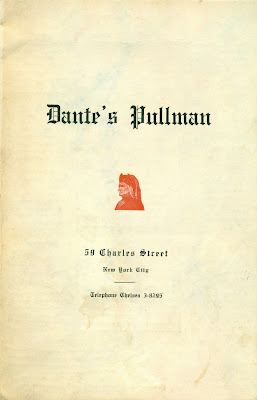 Eleanor mentioned dining at "Dante Pullman NY" on January 24 with John Ely, also of Newark, N.J. Perhaps John's choice of this restaurant suggests something about its clientele. John was the son and grandson of Wilson and John Ely, the architects who built Newark's City Hall and several other well-known buildings in New Jersey. John studied architecture at Princeton and in France and also enjoyed dining at the restaurant "El Chico" at Sheridan Square. In 1931 he sported a raccoon coat. The couple returned to Newark "through Fort Lee" at 4:15 a.m. The GW bridge was opened later in 1931, so I presume that they took a car ferry back to New Jersey.